We have many opportunities for groups in our home building, renovation, repair and ReStores. Some require sponsorship while others do not. There is no experience required! Whether you are a corporation, faith based, or community group we welcome you. To learn more, please look through our Group Opportunities. Home sponsorship provides the core funding for our mission. We work with individuals, corporations, faith groups and others to fund the “sticks and bricks” expenses to build simple, decent and energy efficient homes through our home sponsorship program. Volunteers build homes with Habitat construction staff guidance around the Valley. We are currently building in Apache Junction, Avondale, Glendale, Mesa, Peoria, Phoenix, Surprise,Tempe, Casa Grande, Chandler and Scottsdale. If your organization is interested in learning more about Habitat please contact the Development Office at 602.262.8661 or email us through our contact form. TeamBuild With Purpose is a group volunteer event created for businesses, corporations, and faith-based organizations looking to make a positive impact in Valley communities. This memorable day of building is perfect for departmental outings, team training and convention groups. 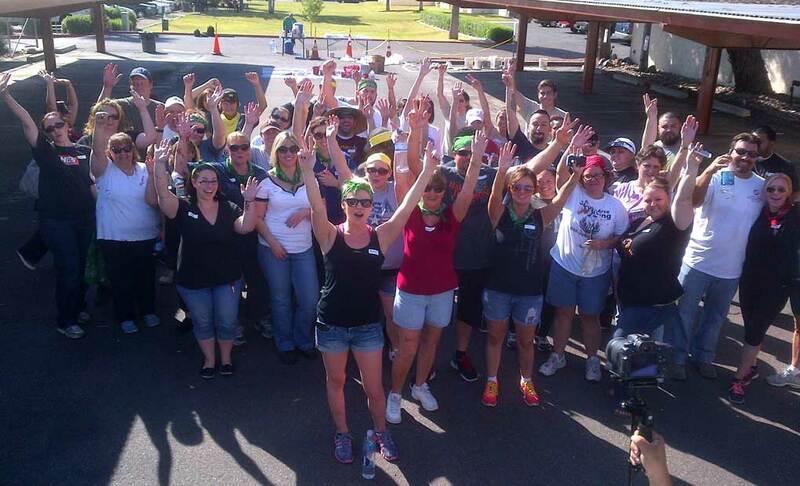 TeamBuild volunteers create an immediate difference as they partner with Habitat for Humanity Central Arizona in building, renovating or repairing a home. TeamBuild also allows the group to help Habitat accomplish its goal of eliminating overcrowded, substandard housing through a donation to the affiliate. TeamBuild With Purpose opportunities for groups with more than 30 participants or less than 20 participants are usually available. Donations for such groups are customized according to group size. For more information please sign up on our Group Volunteer Registration form by clicking here. Habitat for Humanity Central Arizona offers group volunteer opportunities through home construction, ReStore and hospitality. To register a group please fill out the Group Volunteer Registration Form by clicking here. After your group day is scheduled, we will send you a Volunteer Packet with all pertinent information for your build day. All participants must complete and sign a Waiver of Liability. The Volunteer Team will send you the waiver with the packet and volunteers can turn them in at the site on your build day.